Wow! Just got back from the grocery store and had another donation! Thanks so much to the sender! Holy $hit stains Batman! I just received 400,000 Zeit! Whoever did that, thank you so much! That was the most generous thing! This is really shaping up to be one of the best alt-coin communities out there! Nice, I just gave up mining on coins4everyone after several days of mining. I got maybe 200 coins but there's not enough power to finish a block. They worked well with Mintcoin...oh well. I'm still going to keep trying to mine the Zeit! I feel your pain my man. Generosity shown to me by the members of this community is generosity shown to you. Check your wallet. Oh wow thank you so much! Let's get over the giveaway people and get on to business. This giveaway is going to be the death of this coin. +1 What is the next thing we can do to improve ZEIT! +1 so over the whining and complaining. This coin is representing a movment that is against greed. STFU and enjoy the coin and community. I'm afraid I'm new to the concept of minting. When does it happen and how often? An example would help. Lets say I instantly mined 100,000 ZEIT today and stopped mining...what happens next? I'm with you, Iv got all my rigs pointed at this coin (hash.so) working great (still no wallet though) so hoping ill have some coins that i can free up soon to help get this coin going! I know dev is doing his best to get this giveaway out of the way! once thats done im sure they have a plan and if not at least able to get something to form amongst us. Iv been watching auro coin, 25th is when it all goes down for them so depending how that plays out, may be a good strategy for zeit? also zeit has a huge following big enough to give this coin some real weight so maybe if dev goes with a list of us miners and supports to show that this coin has backing from actual people who want to see this coin thrive....for what ever you reasons....that will help in maybe getting them behind us as well? anyone got an estimate of how many supporters currently for zeit? you think I can get to 20-30 @ Satoshi? Again, it was greatly appreciated. You definitely are in the spirit of this community and the message that is being sent. Thanks you again, and to the other person who donated as well. 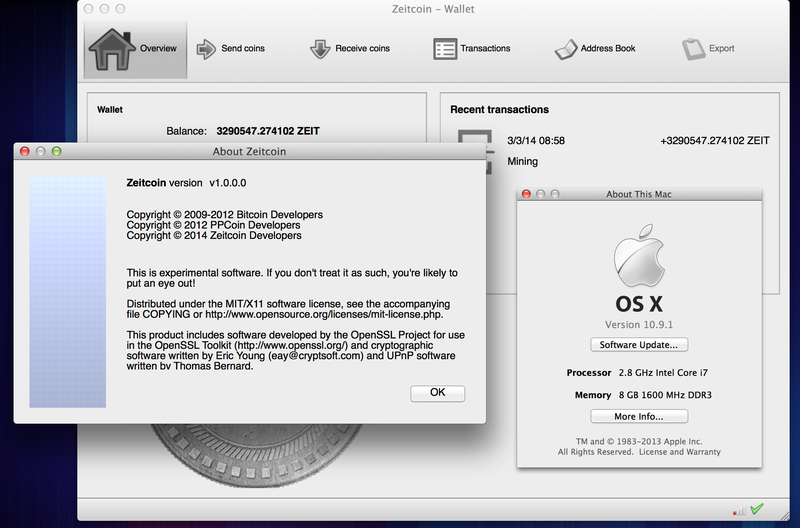 Everyone who's been having trouble with a Mac wallet this is the one I have working on my Macbook Pro Retina 2014. It was created by user Sammy007 and weighs in at 23.9mb. I don't know what the difference is as I've seen other wallets and most only weigh 12mb or lower. Regardless the following wallet works, I have linked to it below. I can confirm I closed and re-opened it multiple times without any crashes or immediate errors. My Macbook is brand new clean OS X operating system with the latest updates, I bought this last week and use it purely to hold all of my scrypt coin wallets. No special software or anything has been installed which is why it runs without any hiccups. 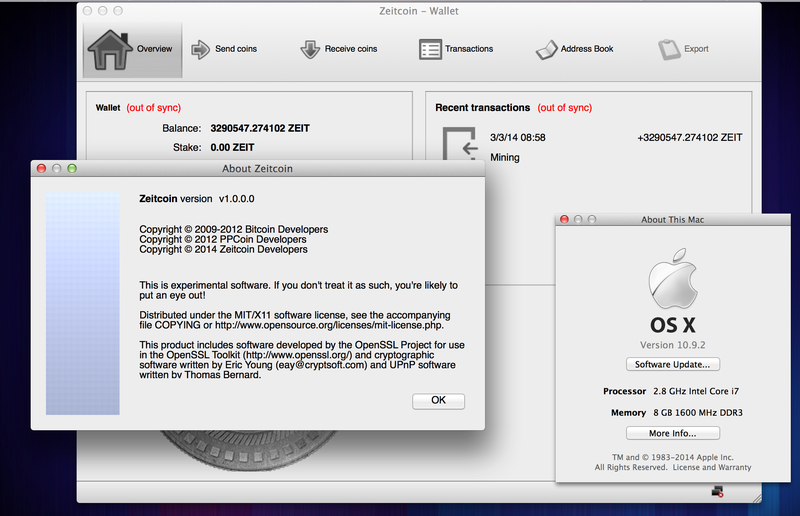 Note: I had to add a Zeitcoin.conf file with more nodes from the front page to which I get 4 connections at a time. It syncs fairly quickly. OFFICIAL ZEIT APP FOR WINDOWS PHONE IS OUT!!!!! I'm already working on v 1.1 to add wallet function, more info (like pools) and real time price! Few other things!! I will try again when I get home. As a side note, you are not on the latest OS, which is 10.9.2. Anyone with loads of coin who want to swap some fry that I have (about 10k fry) for some zeit pls pls pm me. Please check this Version for Mavericks, latest Compiler, 64Bit. Don't extract with special Compressor, only Apple compressor. This Version is working on two 64Bit Macs here, Mav 10.8.2 installed, latest SSL Fix update..
Alright I updated and it's still running just fine. It hung a little bit at loading block index but working flawless here.